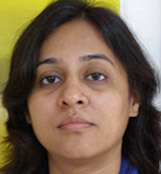 Anu Kulkarni was born in 1975 in Pune. In 1997 she received her Government Diploma in Drawing and Painting (Pune). In 1998 she graduated with her Diploma in Art Education. In 2000 she received her Masters degree in Painting (Pune). In 2001 and 2004 she had solo exhibitions at Jehangir Art Gallery, Mumbai and Hacienda Art Gallery, Mumbai. In 1997 she held an art workshop at Lalit Kala Academy, Bhubaneshwar. In 1998 and 1999 she participated in the Bombay Art Society exhibitions and took part in group shows at Birla Kala Academy, Mumbai. In 1999 and 2000 she participated in the Camlin Art Foundation exhibition. In 2002 she exhibited in a group exhibitions at Bal Gandharv Kala Dalan and Yeshavantrao Chauhan Kala Dalan in Pune.In 2006 she participated in Deccan Contemporary at Ravindra Bhawan, New Delhi. In 2006 she exhibited in a group show at Jehangir Art Gallery, Mumbai. In 2007 she participated in Art Fusion at Nehru Centre, Mumbai. In 2008 she participated in a group show at Hacienda Art Gallery, Mumbai. In 1995 she was awarded by the V. V. Oak Foundation State Exhibition, Pune. In 1999 she was presented with the Atur Foundation Exhibition award and an award from the Art Society of India.